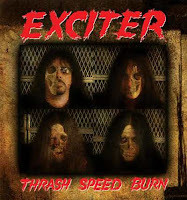 By the time Thrash, Speed, Burn came around, it had been eight years since Exciter had released new, original material, the widest gap in between studio albums of their career, barring the New Testament compilation. As happens so very often with a lot of these underground veterans, members arrived and departed, the core of axeslinger John Ricci and drummer Rik Charron remaining from the Blood of Tyrants lineup, and Rob Cohen joining on the bass. For the third time in their history (I'm not counting Malnati from the 1988 s/t), Exciter had been blessed in finding a singer of some considerable talent. Winter sided more on the Jacques Bélanger side of the spectrum than the more raw and unpracticed appeal of Dan Beehler, with a hostile, high pitch that stays on target, though never quite as uncanny and out of control as Jacques. You can hear a bit of the usual suspects, primarily Halford, Conklin, and Dirkschneider in his tone, maybe a little 'Blitz' Ellsworth in his lower timbre, but he's probably the most balanced of the vocalists in the Exciter stable, and his presence contributed greatly to my own enjoyment of the record, since I found a lot of the songwriting here to be par for the course, angry and lean and similar to the level of aggression found on their 1992 album Kill After Kill. I was actually quite happy for that, because I'm not sure I could have stomached another Blood of Tyrants and it's a positive that the band had settled back into their role as the reliable Canadian speed metal mavens in a world where Razor were doing little but the occasional novelty gig and Anvil were off being movie stars. This isn't rocket science, people, but it's fuel enough to at least reach the velocity you'd need to escape Earth's atmosphere. Ricci inaugurates the disc with some distortion and his whammy bar, and they bust into a relatively fast paced, pummeling array of chords that Winter's voice easily slices through. There are pure rippers here like the titular "Thrash Speed Burn","Demons Gate" and "The Punisher", the third of which features some of Winter's most infectious screams on the album. But in true Exciter tradition, they also slow the pace for some more 'atmospheric' and diabolical cuts like "Evil Omen" or "Crucifixion". I like the coiled pump and density of the bass guitar tone, and the gang shouts here are well placed and make sense rather than standing out like the sore thumbs they were on Blood of Tyrants; and I think this was also Charron's best overall performance as the resident god of thunder. Still, though, Thrash, Speed, Burn never really tries anything new or different and it falls well short of exceptional. As far as Exciter's canon, the riffs here feel fairly fresh and never carbon copies of their past material, but they nonetheless have that familiar scent about them that does not seem as if a whole lot of effort was placed in their construction. Ricci's leads are unhinged and entertaining, and Winter's delivery sharp and well matched to the aggressive writing, but the songs don't really stand out long after listening, and the lyrics are basically just an incessant stream of cliches. That said, this is at least the best of Exciter's output since Kill After Kill 16 years earlier, and marked a new foundation from which the band could build a future that I doubted anyone would think possible after all the many years and roster changes the band had undergone.